Gérald Clerc, representing the brand’s fourth generation, is the creative force behind the Hydroscaph, a timepiece that embodies a new type of construction by incorporating the most advanced technologies. 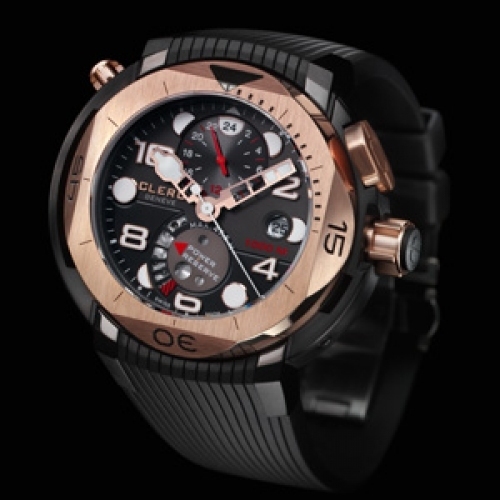 Comprising more than 75 components, the patented 18K red gold and black titanium case is equipped with a helium escape-valve guaranteeing water-resistance to a depth of 1,000 metres. The Hydroscaph comes with an exclusive crown-activated rotating bezel mechanism and adaptable lugs. Ref: HY-GMT-312. Manufactured in Switzerland. Three-year international guarantee.